So much yarn, so little time. : Craft Fair today! I don't know about you, but I love to see "real life" people coming up to my stall and see the smile break out. They don't always buy (shame!) but they do always smile. I was more than a bit miffed though to be competing with another knitter, whose toys were very very cheap and (without exception) knitted from published patterns that I know are copyright protected. If you're a crafter, I'd love to hear your views - what would you have done? I didn't just fume in silence, I told the organiser. I don't think the average punter can tell the difference between an original design and a copyright-protected pattern for a Bob the Builder doll - and if it's a choice between paying me £20 and the other stall £3 ... easy guess! So - my question to you is - what would you have done? Its that bloody "change 3 things" rule that's the problem if you ask me. Some people don't seem to get the fact that using a different yarn that requires different sized needles and in a different just doesn't count! I would have done the same as you, good on you! Your meercat buyer looks proud as punch to own his own nifty knit - lovely photo. I think you did the right thing. Being nasty to your competition right next door would have not looked good on you. Though the poster Leanne suggests and/or a "Toys from ABSOLUTELY Original Patterns Designed by Me" may help discourage the copyright infringers. I don't think it will make them go away - but they won't be comfortable around you. Good for you complaining to the organiser - if nobody says anything it will never get better. I have looked at so many craft fairs round here with a view to taking a table in the future and at each one I have thought...no. No customers, cheap 'crafts' - it would a waste of my time and the table fee. 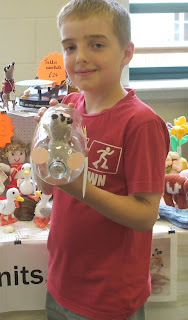 Nifty, I just love the photo of your happy little fellow with his Meerkat. That is so sweet! I also understand your concern about the seller selling items that are made from copyrighted patterns. I would have reported them as well, especially since the organizer's contract was strict on the matter. There's not a lot else you could have done, but I certainly think you did the right thing. It is frustrating, and I'm with you on this! I think you did the right thing - what did the organiser say? I imagine at some craft fairs they really couldn't care less. It's a shame. I think you were very graceful. I think these people should be reminded of copyright protection though...through the organisers. That poster politely written on your stall about you,your expertise and how you respect copyright would be lovely to know about you, informative and clear.I but with a conscious anda lot of people do too. I would have done the exact same thing (and have in the past). You are stuck in a cleft stick aren't you. It's a shame but there will always be people who actually don't give a monkeys about the copyright they jsut want a cheap toy. It's the made in China thing - its cheap but it amuses the kids for an hour then we can go buy another one. All you can do is emphasise your originality, creativity and ask the damned organisers to put you somewhere away from that other wool person next time.